Discuss the role of descent and rebellion in society in preserving a democracy. 1787, in writing about Shays rebellion . "And can history produce an instance of rebellion so honorably conducted? I say nothing of its motives. They were founded in ignorance, not wickedness . God forbid we should ever be twenty years without such a rebellion. The people cannot be all, and always, well informed . The part which is wrong will be discontented in proportion to the importance of the facts they misconceive. If they remain quiet under such misconceptions it is a lethargy, the forerunner of death to the public liberty. What country before ever existed a century and a half without a rebellion? And what country can preserve its liberties if their rulers are not warned from time to time that their people preserve the spirit of resistance: Let them take arms. The remedy is to set them right as to facts, pardon and pacify them. What signify a few lives in a century or two? The tree of liberty must be refreshed from time to time with the blood of patriots and tyrants. It is its natural manure." 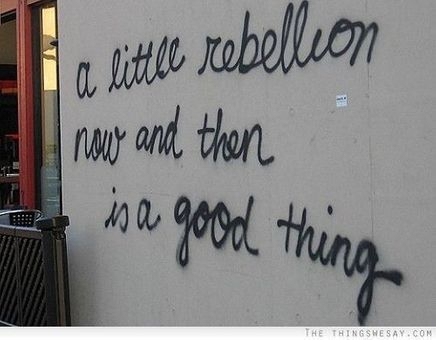 The fact that rebellion exists and is allowed to exist in our society is a sign of the strength of society. Rebellion points out the weaknesses and imbalances in society so that society may become aware of these weaknesses and imbalances and correct them before the basic values that society wants to preserve are lost. As Jefferson points out people are generally unaware of the potential loss because they are so busy trying to survive on a day-to-day basis. The rebellion makes them aware of the possible loss of values and a permanent shift in the direction in which society may operate. Hence, Jefferson felt that rebellion was an essential ingredient in preserving the basic values and institution of a democracy. Without rebellion the institutions will gradually be modified and the original meaning of the institutions and values they represent will be lost.